I made these skewers as part of a surf-n-turf meal for our daughter's recent sleepover. They combine sweet and a bit of heat with classic Thai flavors. The final touch is a dusting of coconut to add an interesting textural component. I basically hate shellfish. I think I may have mentioned my saying about it in a previous post. If it comes in a shell, and it ain't an egg, homey don't eat it. Given that, I didn't taste the final product. However, the ladies Hoovered them in minutes, and they offered great comments. I did taste the marinade and glaze and I can assure you that it would be great with chicken and fish. Combine all of the marinade ingredients in a small bowl, whisk very well, and let sit for at least an hour to allow the flavors to marry. Note: If you're using wooden skewers, soak them in water for at least an hour. 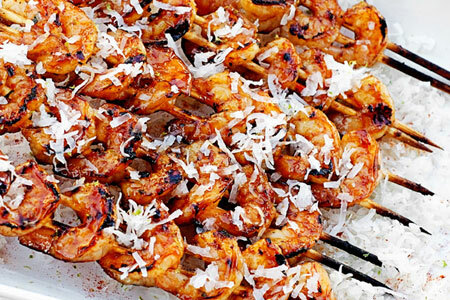 I like to use two skewers side-by-side to keep the shrimp from rotating when you flip them on the grill. Put the shrimp in a gallon zip-top bag, add the marinade, shake to distribute well, then seal and refrigerate for 30 minutes. Drain the marinade into a small sauce pan, bring to a gentle boil over medium heat, reduce by half to make a glaze and set aside. Skewer the shrimp so that they barely touch each other. You don't want them crammed together. Grill each skewer for about two minutes per side, basting periodically with the glaze. Remove the skewers from the grill, brush with the glaze, and sprinkle both sides of each with the coconut flakes. Serve with the remaining sauce for dipping. Sounds delish! I love shellfish! yum!!! can't wait to make these! Love your blog!!!! OMG this sounds wonderful! I love shrimp!! My boyfriend and I just graduated college and are beginners in the kitchen but this recipe made us look like a pro! We used the George Foramen (apt living = no grills allowed) and regular basil and we are blown away by how well this dish turned out! We're already planning on making this dish for our parents next weekend! We can't wait to try this marinade on chicken too! Thank you!!! 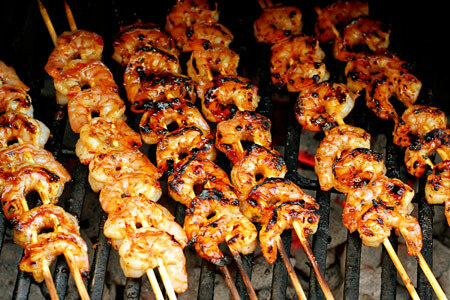 The shrimp look great and the marinade sounds just perfect, I love thai flavors. I also refuse to eat any sort of shellfish. I stumbled on your blog randomly and these look like phenomenal dish to serve my shrimp loving friends at parties. Can't wait to see what people think!